Media captionWATCH: Where's the VR on Xbox One X? 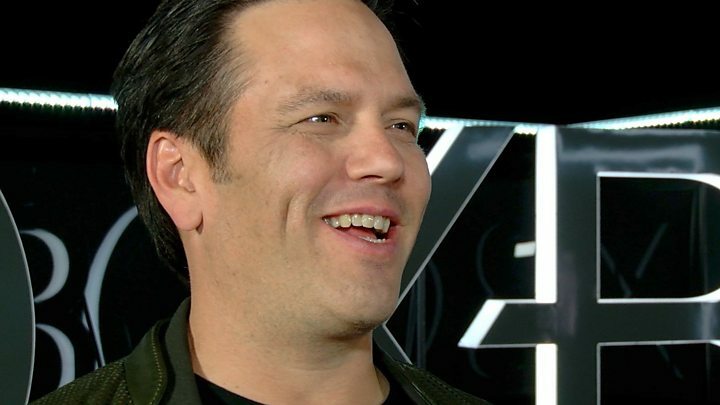 When introducing Microsoft’s newest Xbox console in 2016, Phil Spencer didn’t mince his words. Mr Spencer, head of Xbox, said the console, then codenamed Project Scorpio, “must deliver true 4K gaming and high-fidelity VR [virtual reality]”. The Xbox One X, as it will now be known, looks set to deliver on that first promise of 4K visuals. But on the second? Virtual reality didn’t get a single mention at the company’s bonanza press event on Sunday. I think it’s fair, despite the mild protests of his PR team afterwards, to characterise Mr Spencer as something of a virtual reality sceptic - at least for now. “It’s important to listen to your customers and what they are actually looking for,” he told me. “I don’t get many questions about consoles and mixed reality in the living room. What he’s saying is - the technology isn’t quite there yet, in his view. Contrast that with Sony, whose PlayStation VR has sold more than one million headsets since being launched this time last year. Would you pay £449 for an Xbox One X? You’ll also notice that Mr Spencer talks about “mixed” reality, not “virtual”. The strategy from the very top at Microsoft is not in virtual worlds, but in augmented ones, where digital images are overlaid on to the real world. Microsoft's Hololens augmented reality headset device, though still in its infancy, is perhaps the most exciting piece of consumer technology in development today - and Mr Spencer seems to buy into its potential, more so than VR. “That’s where we see the most interest from customers and developers,” he said. Mr Spencer drew comparisons with Kinect, the motion-control device Microsoft released for the Xbox in 2010. Kinect was at first considered a big hit and around 24 million were eventually sold. There are signs that Hololens and mixed reality could follow that same early trajectory, Mr Spencer said. But that Kinect comparison isn’t exactly ideal. Despite its early success - it was recognised by Guinness as the fastest selling consumer electronics device in history - you won’t see gamers excitedly gathering around a Kinect at E3 this year, and Microsoft has now abandoned bundling in the Kinect with the Xbox One console. It was an innovative technology that ultimately lacked a practical application. In other words: it just didn’t really catch on. Will virtual reality? If it does - Microsoft's choice to go down the mixed reality road could leave the Xbox platform bereft of gaming’s next big thing. Video E3 2017: Where's the VR on Xbox One X?